I live in a low-income apt. bldg where Sec. 8 voucher is tied to the unit; my complaint is there is a Gym in the first floor and 5 to 6 dys. per week beginning at 5am, the patrons start lifting & dropping 100 to 300 lb. weights at 5am and wake up the entire tenants, have brought this to the property mgr’s. attention but we are constantly being ignored, should I take this complaint to CHA OR HUD. WAITING FOR YOUR REPLY. I have several questions. First is the gym part of the amenities of the unit or is it a separate rental space. If it is separate rental space it becomes more difficult to deal with. If it is part of the amenities, you can pressure the management company to change the hours for use of the weights. Are other tenants bothered by this problem? If so I would start with a joint letter to management asking them to do something about the early morning noise. Are voucher tenants the only ones above the gym. If yes this is something to contact HUD and CHI about the issue. The gym may have a lease, which will create problems. My 92 year old mother’s building has no heat due to furnace needs replacing. Landlord lives in building and she has to stay at my sister’s place and it has been five (5) days today 2/25/18. He wants to provide heaters and she is frightened of heaters with all the stories of apartment fires and he would have to provide heaters in six rooms. I’m some what familiar with Chicago laws as far as heating issues, my question, does my mother has to stay in her apartment if he provides heaters? She living month to month because no lease has been provided, new landlord and he is slow with repairs, door bell to her apartment is not working, there is a ceiling light issue when I was there in September that if I had not turned the switch it could have caused a fire, to this day it is not fixed. I have other issues, please contact me, I live in Los Angeles, CA. Thank you. Sorry for the delay in responding to this question. The laws governing your mother’s situation are vague at best. Certainly the landlord needs to provide heat. My questions would be has your mother called the 311 and requested an inspection. Even though the Residential Landlord and Tenants Ordinance may not apply the building code still does. Secondly, have you written a letter to the landlord stating the problem and suggesting a possible solution. The landlord may agree and if the landlord does be sure to get the agreement in writing. I am having this issue with my landlord. We are currently renting a two bedroom apartment and heat is included in the rent. The landlord lives in the building and basically spends all day in the building, therefore, he has quick access to control the heat. This has been brought up to his attention, but he simply does not care. I have forwarded a complaint to the city twice for inadequate heating. The temperature in the apartment has gone down to 57 degrees during the day and 54 during the night. The city inspectors have come to investigate, however, the times they have been here the landlord turns up the heat. Today, 17th of January 2017, the temperature in the apartment went down to 57 degrees (I took pictures of what the thermometer was showing). We have children living in the apartment and in all units in this building. This is so frustrating, because there seems to be no way to prove actual temperature in the apartment, beside taking video or picture of the thermometer. However, it is not like you can prove that the radiators are actually turned off, or have the inspectors come in immediately to look into the issue. They usually show up a week later (as it happened the last time I sent the complaint). Does the landlord live on the premises? If not you can purchase a space heater and take the cost of the space heater and any increased electrical costs off the landlord. It is important for you to start a heat journal to document the temperature of your unit on a regular basis. If you would have to sue the landlord you will need this documentation. You could take a picture of a thermometer and your watch in an effort to further document your situation. You also need to create a paper trail with the landlord. You can write a letter stating the temperature and requesting the landlord to fix the problem. I am having heating issues with my landlord. She is installing a lock box on my apartment thermostat to control the heat. The thermostat is really old(like 30yrs old) and does not accurately record the true temperature inside my apartment. My rent includes heating/cooking gas which the landlord pays. Is this legal for the landlord to do so? What are my rights as a renter? There is no law about installing lock boxes. There are laws that require landlords to give tenants notice before entering. This would include realtors representing the landlord. If the realtors are just coming over, you do not need to let them in. If they are coming in unannounced, then you could start by writing a letter to the landlord stating that the law requires 2 days notice of any time the landlord intends to enter. Regarding the temperature, there are minimal temperatures. The landlord has to provide heat at 68 during the day. There are no maximum temperatures. My landlord tried to fix the heat years ago and it took his workers family members over two weeks day and night with us five women living here and they had to undo a fire hazard the other worker created. In the end the heat only worked for a short while and since we have been using heaters and the stove because after the last time 2 years ago which made 6 times that year of their attempts to fix and make it worse. We have gas on but no heat. My boyfriend and I have had low water pressure in our shower and very no hot water in the shower for a few months now. If we let the water run for 20-30 minutes, we get warmish water, but not hot; the bathroom and kitchen taps get hot water. Also, the water pressure out of the shower head is a trickle, it is fine in the bathroom and kitchen taps. The past few days, I’ve filled a pot with hot water and poured the water over me to “bathe”. I washed my hair in the sink. The beginning of December my boyfriend sent them an e-mail, they sent out both maintenance men, one took photos, and we haven’t heard anything since and nothing has changed. Yesterday, two months after the e-mail, my boyfriend re-sent the e-mail. I’d like to send a letter saying that we’re going to start reducing our rent, but not sure how much to reduce. Also, I understand that if we withhold the rent, that we have to pay it back when the repairs are made. What if we move out first. We are looking for a place, but it since we haven’t found one yet, it could be another 2-3 months before we move out. My first suggestion is that you take a pan full of water and after 2 minutes of letting the water run and take the temperature of the water. Then I would send a letter to owner informing them if the problem is not fixed within 14 days then you will withhold a percentage of your rent which reflects the diminished value of the unit. One way to determine how much to reduce the rent by is to see how much less a unit goes for that does not have a shower. That may be difficult but some SROs will have a shower in the unit while other have a shared shower. You could calculate the percentage difference. This may not be the same but will offer some insight as to what percentage to reduce the rent by. If the landlord does not fix the problem within the time allowed, you can reduce the rent and the law does not require you to return the money. You might also want to propose an amount to the owner and ask for a rent rebate since the hot water has not been working. You have been without hot water since December that is certainly worth something. Who knows the landlord may make you an offer. Make sure any offer is confirmed in writing. You could try using our web app at http://www.squaredawaychicago.com to help with this process. Pingback: I'm a Tenant in Chicago and My Heat Doesn't Work. What Can I Do? Is the landlord also responsible for keeping the hallways heated along with the basement area where we do laundry? We have to dress like “nanook of the north” to go into the hallways and downstairs to do your laundry or open the front door. A family member is renting an apartment in a building with two units. They are renting the second floor and they are responsible for their utilities. They reported that not too long ago they realized that they are paying for gas and light for the basement also. She reported someone lives there but they are not sure if is a legal renting unit. She reported that the meters are inside the basement apartment, so she is not able to get it inspected by the company. Is there anything she can do? The tenant should have access to the fuse box according to the building code. Your family member could call 311 and request an electrical inspection from the City of Chicago. The tenant can also write a letter to the landlord requesting access to the fuse box. I would also complain to Comed and demand that they inspect because the utility laws also only make you responsible for the electricity the consumer uses. When I moved into my south Chicago apartment the gas was turned off. I specifically ask the landlord before we moved in if all utilities were on and only need to be transfered. He informed me that they were infact on. It wasn’t until the day we moved in that I realized the gas was off and called the landlord. He took 5 days to call me back and an additional 6 days for the gas company to come out and contect the gas. I am being charged a $35 connection fee on my bill and want to know if I can deduct the connection fee from my rent? I also never signed a lease. This sounds frustrating, though I am not sure that you have many worthwhile remedies. You can call an attorney and ask them. I am not an attorney. Who charged the connection fee? If it is the gas company, then you will probably have to pay that cost unless the landlord was at fault. This is in regards to plumbing. We are in Chicago living in a 3-flat built in 1923. The 3 of us signed a new lease July 1, 2012. Landlord pays water. The Ad stated NEW plumbing. We have been having problems with the toilet, shower & kitchen sink backing up. The owner came out, flushed the toilet twice, said there was no problem. The next day we spent hours trying to plunge the shower, toilet, and the kitchen sink was backed up while washing dishes. Today was the worst, when we called the landlord, he said Everything was in fine working order when we moved in, that he’s ‘f-ing getting tired of you people already,’ said it’s the City of Chicago’s fault because everyone is using their water at the same time (it was around 2:30pm! ), there were never any problems before we moved in (the last tenants were 19-year-olds who told us he was a slumlord and probably didn’t even know they had rights), then admitted the plumbing was over 2 years old, and said he’s not coming out or sending anyone to fix it because it’s too far and takes too long. Our last place was much older-built in 1886 in the Lakeview neighborhood-and it was a simple matter of snaking the bathtub. But this guys is yelling and arguing with us! I see this as an emergency–Do we have to send a certified letter and give him 14 days? That’s too long. Does a formal request via email hold any weight? And in this particular situation, is there an alternate time frame to demand this be fixed, like 72 hours? Time is of the essence here. The nearest toilet is at the Dominicks 6 blocks away. Help! If the plumbing is not working and you are unable to use a toilet then you may fall under the essential services provision of the law. In this case the time line is shortened to 3 days for terminating the lease and 24 hours for reducing the rent or using the rent to pay for repairs. I cannot say for sure that your situation falls under this part of the law. As for using email to contact the landlord. There has not been any specific modification to the ordinance to recognize email The law began before email became a norm. If the landlord responds to your email then you will have a good argument that the landlord received written notice. Great forum for questions. My issue is similar to marina …however let me explain further. We (my aging parents and I)moved into a 25 yr old townhome that had been vacant for over 18 months. We are paying premium rent plus utilities in order to have a main floor bedroom bath for my parents. When I moved in May 2011 the AC was not functioning properly–turns out the filters in house had not been replaced for years and were filthy. We have been good tenants but heat and ac have been issue. Owner is not very responsive and when heat went out this past November we went 5 days with no heat, using fireplace, space heaters and gas stove to heat home. AC is now HUGE issue and homeowners have voted not to allow window AC unites–we, as good tenants asked about them as nothing in covenant. Owner not responsive an on Friday told me that we could break lease and move as we are problem tenants because she has had to had furnace and water softner replaces since we arrived. She admits AC unit is old–we have told her vents on basement and first floor closed, am using 4 fans upstairs were temps averages over 85-94 degrees with the AC running. What can we do? My parents are old, I just had surgery and have rooms upstairs, and it is nuts! It seems like there are several issues. 1. The home owner association voted not to allow window air conditioners. I do not what the covenants are but the board may be able to do that and you as a tenant would have to follow that rule unless it violates a city, state or federal law which I cannot think of any that it does. 2. The air conditioner is not working up to par. There are no laws that state an air-conditioner has to be able to cool an apartment to any certain temperature. It makes it harder to use a repair and deduct. 3. There are some portable air-conditioners that do not hang outside the window and would probably not violate the window air-conditioner ban. Maybe the owner would be okay with paying for that. 4. If you do decide to move, make sure that you everything in writing including what happens with the security deposit. We currently have no hot water. About a month ago, when, at the request of the landlord, the maintainence guy was laying tile in the basement, the hot water went off. Then, after a day it was scalding hot. When I went down to adjust the water temperature on the hot water heater, the hit water went out completely. We were told then that the dust from laying the tile triggered the sensor and caused the hot water heater to go off. The maintenance guy has been over a few times to jiggle “this” or press “that”, but the heater doesn’t stay on more than a day. We’ve been going back and forth now between the property manager and the maintainence guy. They had a plumber come out about a month ago who ordered the part. The part never came. Or at least no one has come to put it in. Now the property manager is saying that “the dryer lint is being sucked up into the vent of the hot water heater causing the sensor to cut off. The plumber says the water heater is in good working order.” This is in an email to me. We have lived out our first lease here (April 2010 – March 2011), but the property manager didn’t ask us if we were going to resign until April 2012. At first we said yes, but we are moving on June 30th. So, currently we do not have a lease. The law regarding hot water is that the landlord has to fix the problem. Once the landlord receives a letter to the owner asking that he the hot water be fixed, the landlord has 3 days to make the repair. If it is not made within that time then the tenant has the right to terminate the lease or the tenant can reduce the rent to reflect the diminished value of the unit. The owner may argue that it was fixed when the repair person came out and it went on temporarily. In that case you may want to write another letter to the owner, stating the same thing. Hi, I live in a condo building (and there are some rented units in the building). I actually do not care that much about heat during spring and fall and instead want to have AC. However, because of the heat ordinance we have heat on even when it is 80F. If I open the windows the train noise makes it impossible to get any sleep. With windows shut, it gets so hot and stuffy, my blood pressure goes up. We are not allowed to have window AC units. Does heat ordinance apply to all condo buildings? Is there any way to get an exception from the rule for our building? There are no laws that require an owner to provide air-conditioning. There are laws that require landlords to provide heat (if it is needed) from September 15 to June 1. The temperature in the day must be at least 68 degrees. As for AC units, the condo association can limit their use. As a suggestion, they now make portable air-conditioners that do not stick out the window, you might want to check to see if that would be okay. I don’t know if I am covered at all. So far, my landlord says the heating laws don’t apply to her. She has absolutely no heat on most of the time. I complained and she finally said she would give me my “indulgence.” (I pay half the utilities so it’s not like she’s doing me a favor. ) She finally is putting the heat on but turns it off when I leave for work, and turns it on at the bare minimum when I get home. The house is chilly. She keeps the thermostat at 60 when I am home, never higher. She has also given me instructions taped to numerous doors to remind me to shut the heat off before I leave for work. I have a 6 yr old son that visits me every other weekend and this is not just hard for me, but for him as well. I know I should be grateful to have a roof over my head and someone that allows this divorcee to have my son over every other weekend but it’s so uncomfortable. Since the unit itself is owner occupied, she says the heating ordinance does not apply to her and she doesn’t have to put the heat on at all. Am getting so depressed over this…Please tell me if I have any rights at all? You are not covered by the landlord and tenants ordinance. Though you may be covered by the building code which regulates the unit’s temperature. the problem with the building code is that an inspector will have to come to the unit and if the landlord is there she may just refuse the inspector entrance in which case nothing will happen. I am not sure what you want to do but one decision is figure out if you want to continue to live there. I am renting an apartment. Since October my heat has gone out 7 times, leaving my kids and I to wake up to cold temperatures. The first three times they re-lit the pilot. The fourth time they changed the coupling. And the last 3 times they just re-lit the pilot. My question is how many times can this happen before they have to replace the unit?? What rights do I have if this happens again?? What can i do?? That is a good question and I am not sure there is any exact answer. Do you have any idea what the problem is? I think that you need to document the problem in writing. You can call the city and request an inspection but nothing will probably happen unless the heat happens to be out when you call. You could suggest to the landlord that you be provided with some sore of compensation for the troubles. When we signed our lease for the house that we are renting the leasing agent told us that water, and lawn care was included in the rent. For the first couple of months we didn’t pay any additional money for water, and nobody ever came to take care of the lawn. We had a friend come and cut the grass, and fix up the front yard out of good will. After a couple of months the landlord told us that we have to pay $40/month for water, there are four of us on the lease so I thought that he is trying to basically charge $10/person/month. I also wrote him a letter stating my concern for this sudden charge, and for the lack of lawn care service, and he wrote me a letter back stating that we must pay for the water, he also charged us $40/month for the first few months that we lived there, and didn’t have any knowledge of a water bill. Is he allowed to charge us this after we were told at the lease signing that it was included in the rent? Is he allowed to charge us for those first few months when we didn’t have any knowledge of a water bill, as it is not directly stated in our lease? What should we do? How should we approach this person? You said that you signed a lease. What does the lease say about water or other utilities for that matter? Do you have any written documentation that the water was included in the rent. A landlord is not allowed to change the terms of the lease until the lease ends. I would start putting all your requests in writing so that you can document what is happening. If things get ugly and you end up going to court, the more documentation (letters to the landlord, pictures, complaints to the City, etc) the better off you will be. Another option could be to ask the landlord to buy you out of your lease. It’s stated above that one can call the utility company and pay the bill…are there other options? Can one get the service under one’s name even though one is not purchasing this foreclosed home and sort of “becomes’ a tenant? I do know. Most utilities will turn on the utility if you can show them a lease with the current owner and show that it is a new lease starting since the bill was accumulated. I live in my landlord’s rented out condo (which is really a slightly rehabbed older Chicago walkup with the label “condo” slapped on it). The heat for the apartment is included in the rent. Last year our boiler blew out and we had to survive part of that Chicago blizzard without heat.. my space heater was not cutting it. They eventually got it fixed and the radiator heat was working. In order to make up the money he lost fixing the heat, my landlord raised my rent, which is understandable. Now my issue is that the heat is barely turned on. Its on for maybe an hour during the mornings when I’m off at work, but when its lower 30s outside during the night its not on. The apartment itself isn’t insulated so the heat doesn’t stay inside. Ive already gotten sick, my fiancée is getting sick, and even my dog is getting sick (from laying on the frigid floor since we dont have carpeting – but that’s partly his fault because he’s never in his bed). I don’t know if I should contact our landlord or the condo association (hesitant to go because they never actually help me). I feel that I should go to the association and request they turn on the heat more often or at least review the current timers they have on it. But will I be ignored because I don’t actually own my dwelling? Or should I go talk to my landlord? Since he pays for the heat in my apartment, I’m worried he’ll object to my wanting to be warm. In answer to your question, I think that you need to start with your landlord. The landlord is who you have the rental agreement with. The law states that the unit needs to be 68 degrees during the day and 66 degrees in the evening. You might want to get a thermometer so that you can document the temperature. I rent a room in a house belonging to a family (husband, wife & two children). They live there, too, along with two other adult renters. The homeowner only turns the heat on in the winter a few times a day (for 30-45 minutes), but not at all during the night. He does this to save money to fatten his wallet. Everyone in the house had gotten sick, including his two children. This all happened the past winter, and he’s doing it again. I just figured it’s his house and he can do what he wants. But *I* believe that as long as we pay him money for rent, we are tenants and have rights. If this is true, I fear he might raise the rent (again) in retaliation if I file a complaint. I cannot afford to move out, nor do I have friends/family to move in with. We just want to be warm and comfortable! I am not sure what the law is going to say on this matter considering that the owner actually lives in the unit that you occupy. There is a minimum heat requirement for residential housing. The minimum heat at night is 66 degrees and 68 degrees during the day. You could call the City and request an inspection though if the owner is home and refuses access, I am not sure how the inspectors will handle that. You are not covered by the landlord and tenants ordinance so your rights are limited. Have you had a conversation with owner? What about a space heater? The best thing for me to do is MOVE OUT, but as I stated before, I can’t afford it. I shall call the City and see what they say. I have a section 8 voucher and my landlord is heating the unit during the day only some days. How can I prove that? I would really like to terminate my lease, but if I do I will have to be out of the unit in 30 days, how can a person with a section 8 voucher remedy this situation? People with section 8 have to wait a minimum of 2 weeks before getting moving papers, not to mention the length time it takes to get a unit inspected. I sent the landlord a letter after being in the unit less than 30 days with a number of issues requesting repairs. I was also told that section 8 will no longer do emergency inspections. I really need to know how to deal with this issue. You might want to call 311 and request an inspection from the City of Chicago. If there is insufficient heat, you can try calling Section 8 they may inspect for a lack of heat. We rent a house in the western suburbs. The landlord lives out of state and has been notified that the furnace does not function. This was discovered on the first cold night when we attempted to turn on the heat. We will be responsible for paying for heat, if we ever get any. More than 72 hours had passed since we first notified him and have done so on at least one occasion since. What are our options for remedy? Some suburban cities have different laws regarding options you may have. Some cities may have inspectors that will come out if you complain and enforce the area’s building code. You might want to start by calling municipal officials. Under state law a tenant may use a repair and deduct for the rent remedy if the repair does not exceed the lesser of $500 or 1/2 month’s rent. Here is a link to the law and how to use that http://www.scribd.com/doc/38690515/Residential-Tenants-Right-to-Repair-Act. If you need a new furnace, you should see what your lease says about options such as termination, etc. Calling an attorney would also be a good idea. Hello everyone I have a question I live in a 7 unit building and we had a flood the other night from the rain storm. Now no one has hot water because the hot water boiler got damaged, what can I do? My landlord has not even made a effort to let us know when this problem is going to get fixed. Hot water is considered an essential service and under the Chicago Landlord and Tenants Ordinance a tenant can write a letter to the landlord. Here are potential actions to take. hi there.. good blog, fascinating posts, wonderful layout, great content management. i really like this blog Metropolitan Tenants Organization » Heat & Other Essential Services – FAQ. exactly what plugins do you use for your blog. do you use wordpress or something else. i would like to know. i’ve a blog which does not appear very good at all and its a trouble to work with it. are you on facebook or twitter? i would like to get to know you as well as learn from you. Please reply. My Chicago apartment has been without heat since Monday January 17th. Our Boiler broke (radiator Heat) and has recently been fixed. However, my unit along with a few others are still without heat. I have sent a physical letter to the Management Company, 3 email requests to fix the issue (no response) and have spoke to the property manager 2 times and he assured me they are fixing it. I have also filed 2 complaints with the city and have had no response. It is going on the 7th day now and for the past 7 nights I have had to make other living arrangements for both me and my dog. (I haven’t slept at my place in over a week.) I feel like I am running out of options here and Also, do not have the means to pick up and move in the middle of the winter. What recourse do I have in regards to not paying my flat rate monthly utility bill for heat and my rent? procure substitute housing, in which case the tenant is excused from paying rent for the period of the landlord’s noncompliance. The tenant may recover the cost of the reasonable value of the substitute housing up to an amount equal to the monthly rent for each month or portion thereof of noncompliance as prorated. If you have not been able to sleep at the unit then you should inform the landlord of this and highlight what the law states about this. I am not sure what you mean by flat utility rate. Is this a subsidized unit. We pay 46.00 a month flat for just heat to residential Utility Solutions, a 3rd party company. However, there is heat in other parts of our building. My problem is a bit similar to the ones above. I live in Skokie so I am not sure if the same laws apply to me. We rent a 2 bedroom apartment, we pay our own heat. The rooms are all heated well except my daughter’s bedroom is definitely below 60 degrees. We have not been able to use the room much at all since we have moved in. In the summer it was too hot to be in there and now it is so cold that when I get my daughter’s clothes from her drawer in the room I have to heat them up before she can put them on and to go get her clothes I have to throw on slippers and a sweater. My daughter has been sleeping in our room every night and she can’t play in her room. Basically, we are paying for a 2 bedroom apartment and we are only able to use 1. When I spoke to my landlord about this problem it took him a while to send maintenance to come take a look and when he did, he just said he would adjust the vents so more heat goes in there. This has not helped at all. The landlord suggested we close all the other vents so all the heat goes into that one room and buy a space heater and he would reimburse us for it if we gave him the receipt. My problems with this is we, like most people now, try to keep the heat off whenever possible so we don’t have a huge electricity/gas bill. I don’t want to leave the heater + space heater on all day just to heat up one room. I feel like I shouldn’t have to. Is my only option to accept his offer? Can I push him to actually spend the money to correct this problem instead of sticking a band-aid on it? Because you live in Skokie you are not covered by Chicago’s Landlord and Tenants Ordinance. I would start by creating a heat diary of the temperature in your daughters room. You may want to document the temperature in your daughter’s room as compared with the temperature in other rooms. With this information you can then contact the landlord and see if you can negotiate a reduction in rent in order to compensate you for keeping the space heater on. You can also try calling Interfaith Housing of the Northern Suburbs 847-501-4352 or you can call the City of Skokie and ask for a heat inspection. I just rented an apartment where I’m responsible for paying my own heat. I have a three bedroom apartment with only one central heating unit. There is nothing in any of the bedrooms or bathroom beside this unit located in the kitchen. Basically it heats half the apartment okay. A) I can’t close any doors otherwise I get no heat to the rooms. B) One of the rooms I had to just close because at night it gets down to 50 degrees and makes the living room colder. What are the laws towards landlords providing adequate heating elements to heat an apartment vs. landlords keeping the temperature at a certain degree for supplying heat? I spoke with the company and they specifically told me it would cost too much for them to fix and I could walk from my lease. I’m not in the position where I can walk and have enough funds to get a new lease??? From your description it does not sound like the unit is up to code. The Chicago heat law requires that the all rooms in the unit be heated to a minimum of 68 degrees in the day time and 66 degrees as night. There are several potential options that you may have if you are covered by the Chicago Landlord and Tenants Ordinance. First even if you are not you can call the City of Chicago’s 311 line and request a heat inspection. Secondly you can potentially purchase a space heater and deduct the cost from the rent. You would first have to provide the owner with a 14 day notice to fix the problem or else you will purchase a space heater and deduct the cost from the rent. If the landlord is responsible for the paying the heat then you could also deduct the cost off the increased electricity that you use. 1) How many days/weeks do I need to document the heat diary? 2) If one room is heated properly but several other rooms are not properly heated at all do I still have a legitimate complaint? 3) If the landlord fails to comply or resolve the issue within the stated time frame, can I seek alternate housing immediately? I am 4 months pregnant, and having complications now. I don’t want to wait! There are no regulations for how long to maintain a heat diary. In general the longer the better, though you may want to check in with an attorney. 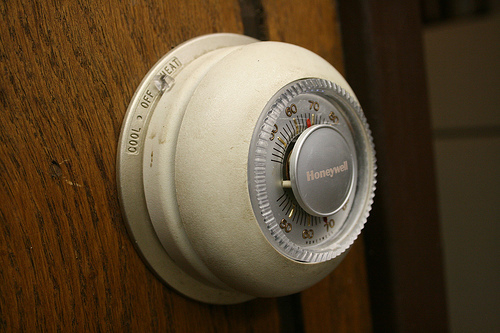 The Chicago building code requires that all rooms be a minimum of 68 degrees during the day and 66 degrees at night. The City can cite for a violation in room. I am not sure what you mean by seek alternative housing immediately. Do you mean terminate your lease and move somewhere else. If so the following is what the Chicago Landlord and tenants ordinance states. I am not sure if you are covered by the law because you did not mention how many units are in the building and if the owner resides there. I am having issues with the heat in my apartment 1) working at all in my bedroom, 2) remaining around 68 degrees. I have attempted to resolve the issue over the phone but the response has been ad hoc and not really resolved the issue. I have already ordered two space heaters to help with this…should I just deduct the cost of them and the electricity bills from next month’s rent, and from every month after that and notify them via certified mail that I am doing this? I am somewhat hesitant to move, but I also don’t have too much faith that they are going to resolve the matter, either. Please advise. The heat laws for Chicago are require that the landlord maintain heat at * 68 degrees from 8:30 a.m. to 10:30 p.m. * 66 degrees for all other times. The first step is to document the problem by creating a heat diary. You can do this by taking the temperature at various time of the day in different rooms. You can deduct the cost of the space heaters once you have written a letter to the landlord. As for the cost of the electricity that may be a little harder to determine though you should be able to deduct the additional cost to bring the unit into compliance though for instance if you wanted to heat the unit warmer than 68 then that would have to be a cost you would bear. The language can be found in the Chicago Building Code 13-196-410.